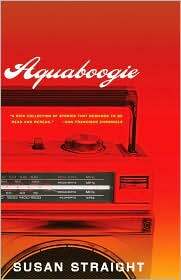 Susan Straight's acclaimed book of short stories Aquaboogie instantly transports the Midwestern reader to a foreign landscape. While themes of love, family, and the yearning for independence are universal, the working-class black communities of Southern California are about as foreign to Minnesotans as the vineyards of France. Despite, or maybe because of this, the stories resonate with deep poignancy. Straight has a superb way of switching perspective through each of her unique characters and intertwining their personal narratives in subtle ways, leaving the reader longing to be part of the community. There is stark beauty in the simplest of descriptions. A woman braiding hair and listening to the melody of her new baby's gurgles while contemplating her husband's new mistress. A fresh ripe peach plucked and made into pie, or greens that grow naturally and are cut and shared with neighbors as a staple to every meal. Yes, there are issues of race and drugs and crime, but that is not what keeps the reader's eyes glued to the page. This is a vibrant portrayal of life seen through a kaleidoscope of eyes. And yet, there are peeks into the well-meaning discrimination and lack of racial understanding that a lot of us are guilty of. This in-depth understanding is something Straight excels in.